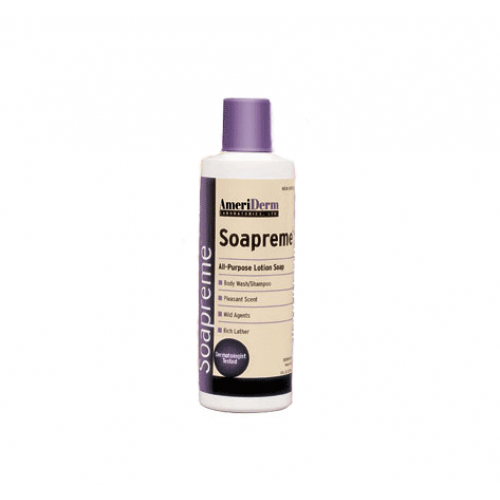 AmeriDerm Laboratories Soapreme All-Purpose Lotion Soap is a multi-use cleanser that is designed to be used as a body wash, hand soap, or shampoo. Soapreme Soap lathers easily to provide the skin with a non-irritating, gentle, long-lasting fresh and clean feeling. The unique formula of this soap is designed with a pleasant cherry fragrance that lightly lingers after washing. It is ideal for use in the bath, shower, or for washing hands in the sink. This all-purpose soap contains moisturizing ingredients that leave the skin feeling hydrated and soft. Soapreme can be used within the home for personal use or is great for patient care in any medical facility. It is available for purchase in 8 oz bottles, individually or by the case (48 bottles per case). This body wash shampoo is amazing. I was bedridden for some time and the nurse used to use this body wash shampoo to clean my body. This body wash has a very nice fragrance and I used to feel so fresh after my body used to get cleaned by this. I am still using this body wash shampoo.